Yesterday, Little Cat A and I went to a local thrift store. It's been a very long time since I've been on the thrift store circuit. Back when I was an owner at Room With a Past, I hit thrift stores and garage sales weekly to gather inventory to revamp for the shop. After a few years of weekly hunting, I was burned out and had to take a couple of years off. But, I'm ready to get "back in the saddle" and hunt again. 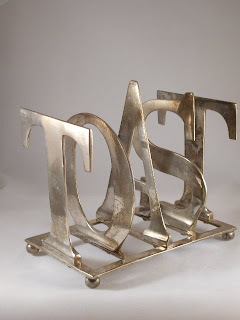 I was rewarded on my first time out by finding this silver toast holder.